Students at Boston College raised their arms in solidarity with the students at the University of Missouri during a demonstration on the school’s campus in November (Steven Senne/Associated Press). Protests on college campuses across the country over racial issues continue, and don’t show any signs of letting up. 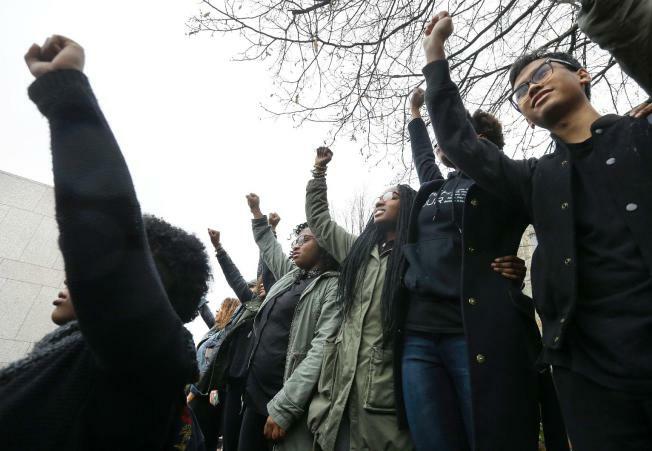 From the University of Missouri to Harvard Law School to Brandeis University, students are demanding that administrators address racial issues on their campuses. To get a sense of what it means to be a student living on one of these campuses, WGBH’s Higher Education desk shadowed two students: a black man and a young woman. Maire Claire Diemer and Kwesi Aaron are both seniors at Boston College. For the past three years, they’ve been walking the same campus. But their experiences have been very different. As a black student, Kwesi says not a single day goes by that he doesn’t feel like less of a person because of the color of his skin. “Every time I walk past a campus tour I’m hyperaware of my blackness because I see a lot of people looking at me like, ‘Hey, there’s one of those here,’” said Kwesi. Occasionally, Kwesi says, his interactions with figures of authority can get violent. “One time at a football game, a Massachusetts State Trooper dragged me by the collar because she thought I was trespassing onto Shea Field during tailgating,” he said.